The parish administrator has the responsibility of looking after the parish. To assist him, two councils have been set up: the parish pastoral council and the parish finance council. These two councils meet regularly and maintain contact with the parish pastoral teams and the parish property teams and, of course, with each other. The parish pastoral council is a group of leaders that shares the responsibility for building the parish into a vibrant Christian community that promotes the gospel values of love, justice, and peace. The council normally has about fifteen members and is formally structured with a chairperson who facilitates the regular meetings and a secretary who records the minutes and deals with correspondence. The members of the council represent the pastoral activities and interests of the whole parish of Dunhill and Fenor. The parish administrator is the president of the council. The council’s pastoral interests include church liturgy, baptismal preparation, bereavement support, faith formation, communications within and without the parish, and many others. Council members are not expected to carry out all of these activities themselves, though they may be involved in some of them, but it is their responsibility to empower the individuals and teams of people who do carry them out. 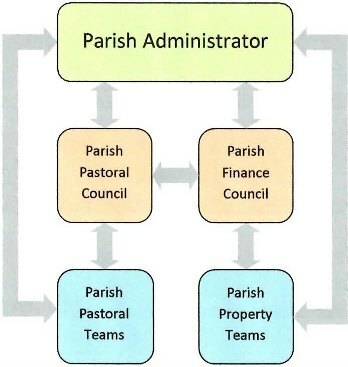 The parish finance council is the chief advisory body to the parish administrator on financial matters. It is the finance council’s responsibility to develop the annual budget, monitor its execution throughout the year, and to advise the parish administrator and the pastoral council on all matters pertaining to finance. In addition, the finance council assists the pastor in the administration of the parish property. The parish property includes the two churches and any other buildings that require maintenance or development, the graveyards and other lands, car parks, boundary walls, and so on. Members of the finance council are not expected to look after the parish property personally. However, it is their responsibility to put in place appropriate administrative and executive structures such as a maintenance team or a development group. The parish administrator is the president of the finance council and there are seven other members. The individuals and teams of people who assist the parish administrator maintain direct contact with him on a day-to-day basis. However, the two councils have the responsibility of establishing the teams, where they do not already exist, and of providing any necessary training, advice, assistance, or finance. The pastoral council is presently compiling a list of all these individuals and teams and, when this work is complete, this web page will be extended.